On the afternoon of December 25th, the 2017 annual summary meeting of the Institutes of Law School was successfully held in Room 307 of Kaiyuan Building. Dean Zhang Shouwen, Party secretary Pan Jianfeng, and leaders of various research institutions attended the meeting. 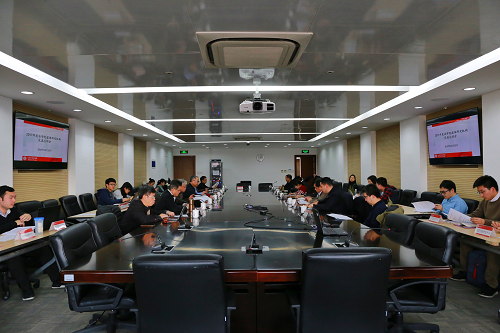 The meeting was chaired by Xue Jun, deputy Dean of the Law School. First of all, Deputy Dean Xue Jun briefly introduced the basic situation of the research institutes of the Law school and put forward the requirements of the Law school for the research institutes in terms of system construction and standardized management. Afterwards, the person in charge of the agency reported the annual work. Prof. Rao Geping gave a brief introduction to the historical development, personnel structure and research objectives of the Hong Kong and Macau Research Center of Peking University, and thanked the Academy for its long-standing support for the organization. Rao said that the center has achieved a number of achievements in academic research, publication, and curriculum teaching this year. The center has organized several academic seminars together with various ministries and commissions of the State Council and the Hong Kong and Macau governments, all of them have achieved good results. Afterwards, Liu Jianwen, a professor of the Financial Law Research Center of Peking University, briefly introduced the work of the Center from scientific research achievements, think tank construction and social services. A.P. Chen Yifeng, who belongs to the Institute of International Law of Peking University introduced the Institute to attach great importance to the cultivation of students and strongly support graduate students and doctoral students to attend international conferences and study abroad. A.P. Wang Shekun from Peking University's Research Center for Resources, Energy and Environmental Law gave a brief introduction to the achievements made by the center in academic publications, research projects, academic exchanges, and social services. Liu Yinliang, a professor of the Peking University Science and Technology Law Research Center gave a brief report on the discipline construction, curriculum teaching, personnel training, academic research, foreign exchange, and task reporting. Zhang Qi, a professor of the Institute of Comparative Law and Law Sociology of Peking University introduced the rich research results of the teacher of this institution. The Institute actively participated in the national judicial reform work and provided expert advice. Prof. Bai Jianjun, who belongs to the Institute of Empirical Law of Peking University introduced an empirical training camp successfully held on this summer and invited well-known foreign professors and scholars to give lectures. Prof. Gan Peizhong coming form the Enterprise and Corporate Law Research Center and A.P. Xiao Jiangping belonging to the Competition Law Research Center gave a brief introduction to the development history of the center, they also talk about fund raising, conference organization, student awards, project completion, and publication of results. Ling Bin, a professor of Peking University's Center for Charity, Sports and Law, and Prof. Peng Bing from the Center for Financial Law at Peking University, have detailed presentations on various special events organized by the Center. Among them, Prof. Peng Bing specially introduced the "New Law and New Finance" sponsored by the Center. The professor of Peking University’s Center of Public Participation Research and Support, Wang Xixin introduced the Center’s research and practical work on citizen participation and government transparency, and provided think tank services for national ministries and commissions. Prof. Xue Jun from the Institute of Rule of Law and Development of Peking University, introduced the long-term and outstanding contribution made by the institute to the legislation of the National E-commerce Law. Mr. Li Nan from the School’s Social Science Department had in-depth work experience exchanges with the teachers who are responsible for the institutes. At the same tine, on behalf of the Department of Social Sciences, he affirmed the good running and standardized management of the law school’s research institutes. Subsequently, Party secretary Pan Jianfeng spoke highly of the work and achievements of various research institutions this year. At the same time, he stated that the annual summary meeting would be of great significance to the work of the institutes. He stressed that all research institutions should strengthen the management of the appointment of personnel and the use of funds, and jointly safeguard the reputation of institutions and departments. Finally, Dean Zhang Shouwen expressed his recognition of the rich achievements made by the research institutes in his speech. He pointed out that the research institutes of Law School are highly distinctive. They are unique among Peking University faculties and departments. All research institutes should focus on cultivating talents through scientific research, strive to introduce innovative achievements, focus on the dissemination and transformation of results, and actively respond to national economic development, and delicate themselves to the need for think tanks in the development of the rule of law, and cultural prosperity, etc. The annual summary meeting of research instituties strengthens the understanding between institutes and builds an effective platform for communication between institutes and the Law school. It has played its due role in building a free, orderly and inclusive Law school’s academic research environment in a new era.